But the appearance of a new ally in the fight has changed all of that. For the first time since the original incursion, Wolfe thinks that maybe there's a chance to stop their implacable enemy before they have the chance to wipe out any more human planets. That opportunity comes at great cost, however, and even as he makes plans for their first offensive move on the Phage, Jackson is all too aware that most of them will not survive. I loved it! I loved the entire series! Mark Boyett could narrate an instruction manual for my Ikea furniture and would gladly listen. The story is engaging and the characters are easy to relate to. 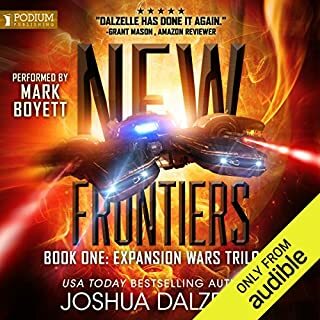 I haven't listened to many of Joshua Dalzelle's books but I will definitely start now. Had listened to several of the Heppner and Larson series and liked them. Saw that Mark Boyett narrated this series so I thought I'd give it a try, listened to the series straight through and enjoyed every minute. Excellent trilogy. I thought the pacing was good and the performance was excellent as always. Wraps everything up, but as predictably as possible. Not a terrible end to a trilogy, but each novel is slightly weaker than the last. You knew the ending before the book started. Wont give it away but it is one of those books after half way through the second book the "Big reveal" in book three was not surprising. This was a let down. Other than this it was not a bad book Mark had yet another great performance it was just the story was a bit lack luster. Performed to perfection. But the end was abrupt and without closure. Most likely someone got board with ending and provided a rather disappointing conclusion. Pity. And finally the interesting part is here! That's the problem - the author has tried to made a trilogy, when he could put all of this content in to 1 or max 2 books and write further development of the story. In general that's the most interesting book from the trilogy, but still the chatty filling content is too much. 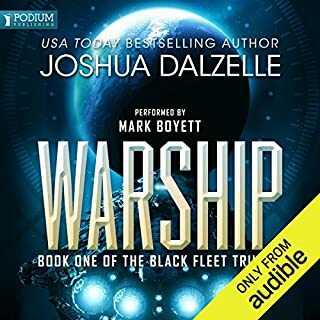 I highly recommend the author to re-think the way he makes new books - I get that the commander has good management skills, but I get tired of listening the same commands he give over and over again.. who cares - we are not ship commanders and we are not so much interested in the so detailed way the commander controls the ship. That kind of development is kinda slow and not so fascinating. There are times when I was forcing myself to listen to the book, while with other authors I simply crave to have free time and listen them. M.Boyett - one of my favorite narrators, simply amazing job, especially in this book, where the chat is a lot and many voices are required. 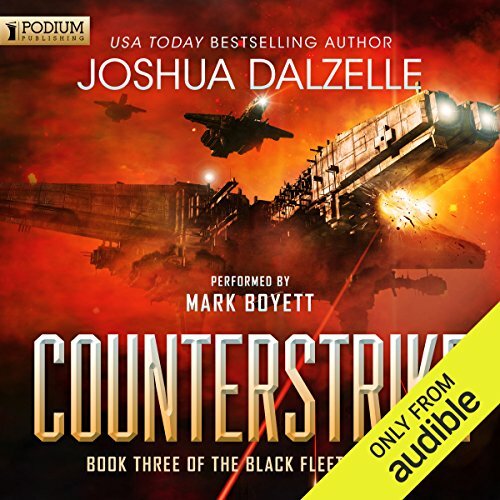 Counterstrike is Joshua Dalzelle's 3rd and final installment of the Black Ship Trilogy. 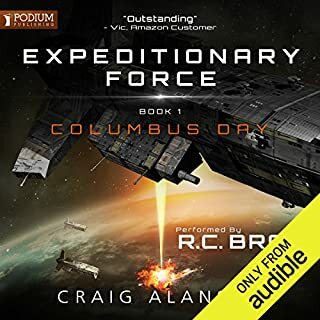 With human forces now focused on addressing the alien invasion and coming to understand the nature of their new alien allies, Captain Wolfe remains unique as the only human who has experienced any contact with the phage which places him in a unique light with their new allies. He becomes privy to the background of Robert Blake and his crew as well as the humanity's place on the galactic pecking order. Wolfe's main character attribute of following his gut rather than his orders, forces him to go rogue and end the phage conflict in his own unique way. At the same time, he learns the frightening origin of the phage themselves and its implications for humanity. The sci-fi elements are in line with the earlier installments with a greater focus on alien biology and intelligence. 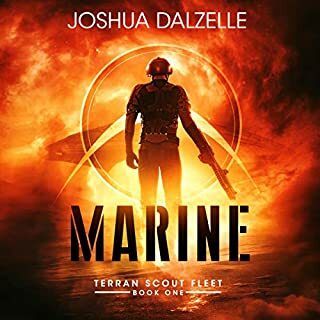 Dalzelle creates a striking juxtaposition of a super-intelligent race unable to defend itself nor contemplate genocide against an intelligent predator species without regard for alien intelligence. Wolfe recognizes this dichotomy leaving him and the listener to ponder the possibility of a third way. The battle scenes are quite well done with humans recognizing the inevitable impossibility of fighting a hive mind mentality from the outside that results in Wolfe's 'hail mary' attempt for closure. Overall, this installment is more cerebral than earlier ones and ponders the various possibilities for future human evolution. The narration is solid with an excellent range of voices of both genders. Alien conversations are particularly satisfying without the more typical nasally or psychomotor retardation renditions. Pacing and mood are appropriate making for an easy listen. I love it when a series sticks true to from throughout and this one does just that. It’s a great fun series which evokes the original Star Trek ethos but set in amongst a major conflict rather than an exploratory situation. Maverick captain, enigmatic aliens, an implacable enemy and lots of “all ahead full” action all set among the stars. Possibly in truth this concluding part is probably a little lighter on the action than the previous two but it brings this long story to a conclusion in fine style and with plenty of cliff-hanging tension. 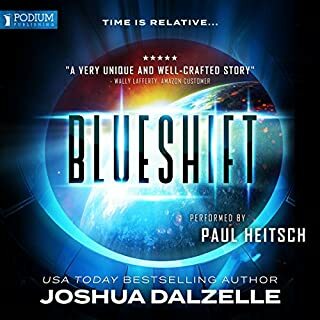 The fine narration makes the story rattle along at a pleasing pace and the whole thing is wrapped up neatly at the end with possibly a slightly more subtle end game than might be expected. 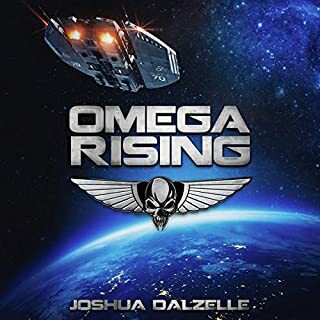 As I’ve said in the reviews of the previous two this is not heavy duty sci-fi this is a good old-fashioned story of humanity attempting to survive against evil alien hordes albeit with some rather unpredictable allies “helping” out here and there. If that’s your kind of thing then this series delivers in fine style. I'm assuming there is more to come in this universe and it was a good listen but - and a big issue for me - it pretends the stuff in the first book with the invasion and worm like creatures never happened. Also, the plot is so straightforward it's painful. I enjoyed it, just won't be recommending it to anyone. The writing involves you deeply in the characters and situational action, I never wanted to stop listening. The performance kept me hooked from beginning to end. Brilliant, didn't want it to end!!! Fantastic book and as always, brilliant narrator, really immerses you in the scenes. Look forward to reading more of his books. could not put my phone down. the whole trilogy was great. ready to start on book 4.